Mark Steel M.S. was an undergraduate when he realized that he would need to complete a master’s degree program and become licensed in order to make his dreams happen. “Around my junior year I began to look into what my options were going to be when I graduated with my bachelor’s degree. I started to realize that what I wanted to do would require a master’s degree and a license; therefore I became determined to have that all lined-up before I graduated. I knew that if I set my mind to it, I would somehow be able to get the funds. I accomplished all I set out to do and my life is exactly what I wanted it to be. I encourage anyone in college to get down to figuring out the reality of their career and make it happen.” -Mark Steel M.S. One of the things that will open unlimited doors for many with a counseling degree is a vibrant and persuasive personality. Like it or not, to some extent in life everyone is in sales. For example, a doctorate gives a scholar a license to lecture and proclaim expertise; it doesn’t mean anyone is going to revere, respect or even like them. What this means for anyone with a counseling credential is that a degree can get you in the door, but you alone are responsible for creating whatever happens inside. For the most part, this notion is a relatively new concept for those who have attended college. In the not so distant past a credential somehow led graduates to feel that they deserved a job and that the real work was behind them. The truth is, college is the warm-up and the work begins after graduation. 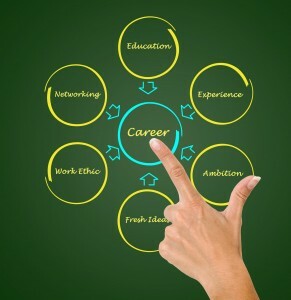 Securing the type of job you desire is going to take more than a polished resume. It is going to take skills in the area of selling yourself as a worthy and deserving candidate. Communication skills are imperative to develop, cultivate and maintain for anyone in the job market. If you are quiet, shy and unable to freely express yourself, you need to address the situation immediately with books, self-improvement seminars, empowerment workshops or speech coursework. Two job candidates with the same resume are not on a level playing field if one is outgoing and self-expressive and the other is silent and reserved. Marie Schiff B.A. received her degree in counseling from a brick and mortar university. She realized quickly that even though she had been a dean’s scholar, she needed to promote herself in more ways than academia. “I began looking for my first job thinking that my degree would be getting me the job. I learned very quickly that my degree was only one part of the package. I had to be the one they wanted to hire. I had to take what I had learned and apply it. After all, I majored in counseling! I had to use the knowledge I had obtained and apply it to the employment process. That was one of the hardest things I’ve ever done, but it was the difference between talking about doing a job to get one, and doing the job to get one.” -Marie Schiff B.A. There’s not a book in the world that can substitute for hands on experience. Example: Would you ever agree to have surgery performed by a doctor who had only read about performing surgery? Of course not, and although that’s an extreme illustration it really makes the point; the doing of something is irreplaceable by simply the knowing of something. For your career in counseling it is pure wisdom to have some form of experience in the field to refer to in your interview. There are unlimited charities and not-for-profit organizations eager to add a counseling student to their rosters of available volunteers. There may even be a selection of paid positions in the counseling field in your geographical area; the point is to get experience somehow, someway. Remember that your degree is one part of a package you are presenting: having experience in the field of counseling is proof that you are dedicated, responsible and have foreknowledge of what a position entails. Patricia Simmons B.A. spent two years volunteering for the local suicide hotline while she was doing her undergraduate work. Belief in yourself with a rock-solid positive attitude is one of the most attractive things you can take to an interview. You have studied hard and earned a degree that is of great value to society for generations to come. Be sure to pat yourself on the back and do not believe in discouragement. A “no” only means that you are surely headed to the best job possible and that you are one step closer. Listen only to those who are encouraging and positive; anyone can sing the blues. You are on your way to opening whatever doors you desire; just be sure to take along your pleasant and inviting personality, your experience and your sunny disposition.